Rev. Jacques-Fran�ois Dujari� was a key figure in the foundation of the Congregation of Holy Cross. His heroic determination to serve the material and spiritual needs of the poor in France helped to lay the groundwork for the mission of Holy Cross throughout the world. Dujari� was born in Rennes-en-Grenouilles, France, on December 9, 1767. He grew up wanting to be a priest and was a seminarian in Angers when the French Revolution broke out in 1789. Two years later, in 1791, when the Revolutionary government required all clergy to take an oath of fidelity to the state, the seminary disbanded and Dujari� returned home. Although most of the people in and around Rennes supported the priests and religious who remained loyal to the Church, it still was not safe. Priests and religious who did not take the oath were forced into hiding to avoid imprisonment, deportation, or even execution. In July 1795, he resumed his studies for priesthood in secret under the tutelage of the pastor in Ruill�-sur-Loir. On December 26 of that same year, he was secretly ordained a priest in Paris. Dujari� returned to Ruill�-sur-Loir and celebrated his first Mass in the middle of the night in a barn outside of the town. He celebrated many Masses and sacraments. If he went out during the day, it was in a disguise. Both the faithful and he lived at great risk in doing so. In 1801, an agreement between Napoleon and the Vatican restored public worship and reconstituted the Catholic Church in relationship with the state. The Church now faced the daunting task of rebuilding. The needs were legion, as the Revolution had confiscated Church property and effectively shuttered most of the Church�s schools and social institutions. Also many priests and religious had been exiled or even killed. In 1803, Dujari� was appointed pastor of the parish in Ruill�-sur-Loir, and he worked zealously to tend to the many needs of his flock. To assist him, in 1806, Dujari� assembled a group of young women to teach the young in a nearby village. These women became the Sisters of Providence, and they were established as their own order in 1831. A few years later, the clergy of the Diocese of Le Mans asked Fr. 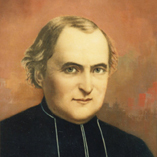 Dujari� to assemble a group of teaching brothers to serve in parishes, and he founded the Brothers of St. Joseph in 1820. The brothers grew quickly as many pastors sought their assistance. Fr. Dujari� realized that this fast-growing group of brothers was still tenuous, and he sought to assemble a group of diocesan priests to work with them and give cohesion to this structure. By now, his health was failing, and so Fr. Dujari�, with the bishop�s consent, selected Rev. Basile Moreau to continue his work. Moreau moved the brothers to Sainte-Croix, a neighborhood of Le Mans, in 1835. Two years later in the Fundamental Act of Union, the Brothers of St. Joseph were formally united with Fr. Moreau�s group of auxiliary priests, thus creating the Congregation of Holy Cross. At the invitation of Moreau, Dujari� lived the last years of his life in Sainte-Croix until his death on February 17, 1838.